Victoria can hold a maximum of 12 passengers and is an unheated open boat with screens that can be used to provide some weather protection. 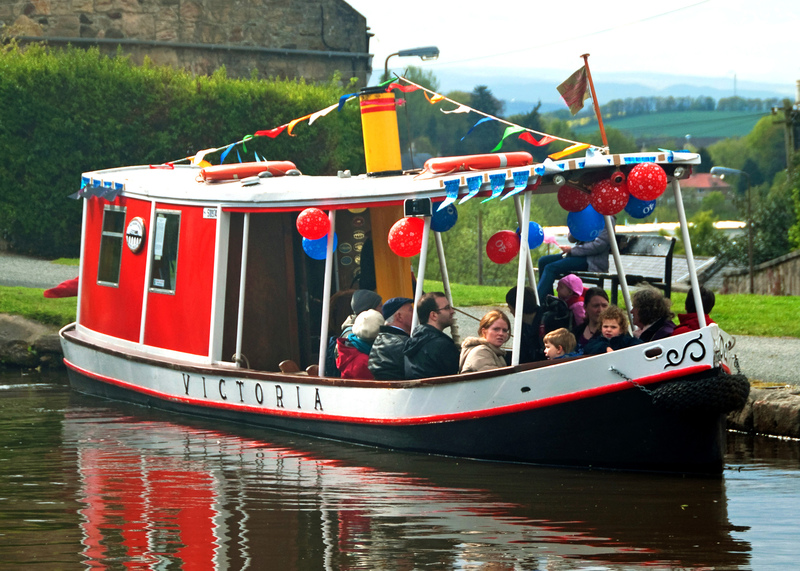 Hires normally leave from the Linlithgow Canal Centre but it is possible for your party to be picked up from a pre-arranged point along the canal. The charge for the first hour is £55 and £28 per hour thereafter. Payment is by cash or cheque on the day of the hire – unless advised otherwise no deposit is required. The LUCS Booking System shows when Victoria is available for hire and enables you to make a booking and to pay on-line by PayPal, credit card or debit card. Alternative payment methods are payment by cheque or by prepaid LUCS Gift Voucher. In these cases the booking will be provisional until confirmed by LUCS. Please note hire requests at less than ten days’ notice may not be possible. Gift Vouchers: If you are thinking of a novel present for Christmas, a birthday, an anniversary or any other occasion, LUCS can provide gift vouchers for the hire of Victoria with a driver and crew. The gift voucher can also be used for the hire of Saint Magdalene with a driver and crew, the self-drive boat Leamington, Town Boat Trips, Aqueduct Cruises and Falkirk Wheel Cruises. To make an enquiry please contact LUCS at – bookings@lucs.org.uk.